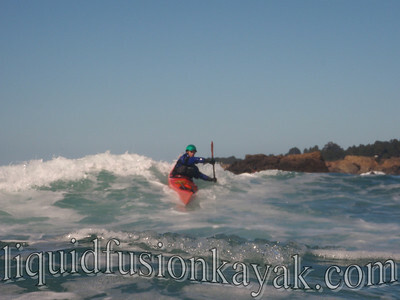 I missed the Golden Gate Sea Kayak Symposium (GGSKS) but as the stars aligned I had the fortune of paddling and playing with 5 of the instructors after the symposium. 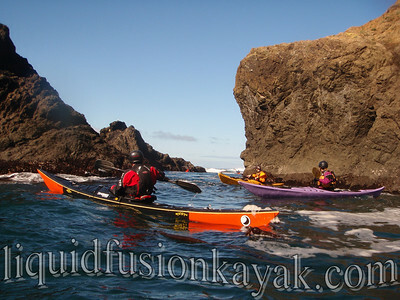 Like the Pied Piper, Jeff played a sweet tune and lured several of the GGSKS instructors to our house and the magical paddling playground of the Mendocino Coast. Paul Kuthe, Dave White, Matt Nelson, and Bryan Burkhardt couldn't resist the piper's tune and came to play. 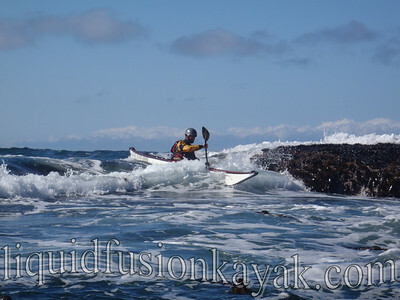 I was a little skeptical about tagging along knowing that my skill level was no where near their caliber and also not wanting to hold them up if they were looking to get some miles in and see our coast. 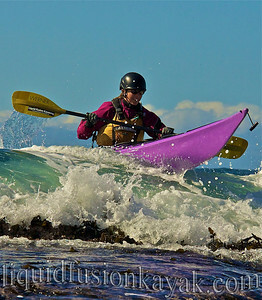 Ahhhh - but what do these guys do for their paddling fun - ROCK GARDEN and SURF! Our Pied Piper led us to a bouncy passage to the south of Russian Gulch and the opening of a sea tunnel that traveled under the headlands. Through this sea tunnel, we traveled to a magical playground of surge channels, pour overs, and slots. After a journey through the milkshake room (aptly named by Bryant) we traveled to a reef break in Agate Cove. 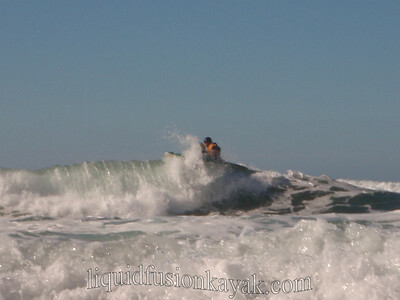 Steep 10-12 foot waves had me stepping back and watching but eventually venturing in for a little fun. The Northwest wind kicked up and made getting into and holding position to catch the wave tricky. The guys carved this baby up and I held on for dear life, keeping my sea kayak from broaching and heading right and into the rocks. After a lunch break, our pied piper turned out to be a business owner who had to get back for a teleconference with the accountant so we all returned to tell our tales. 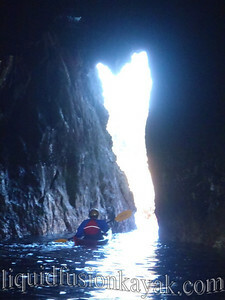 But being in the kayaking business, we couldn't resist a few more rides as we traveled back to our magical tunnel. The northwest wind had kicked up significantly so we stayed on the inside using the rocks as buffers from the wind and breaking waves. I surfed every wave and surge possible to help with gaining headway in the wind. Before traveling through our magic tunnel, we rode one more pour-over. The pour-over was straightforward but holding position in the wind and current was challenging. The guys were much better at holding position than I was but were stoked to see me in there charging it and encouraged me to be patient and wait for the right wave. Back through our tunnel, we returned to Russian Gulch, extended invitations for more play, and sped away - Matt back to Orcas Island, Dave and Paul to Portland, Bryant to Sacramento, and Jeff and I to our meeting with the accountant. 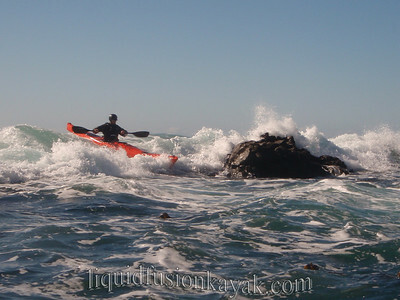 It was awesome to paddle with these guys and I look forward to paddling with them again - Lumpy Waters maybe? Sometimes you surf waves and sometimes you get surfed. The Mendocino Coast has been having epically gorgeous weather. 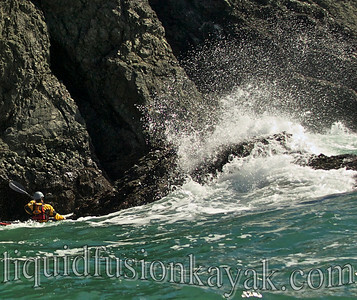 The warm sunny days with little to no wind have been very inspiring to get out and play in the water. 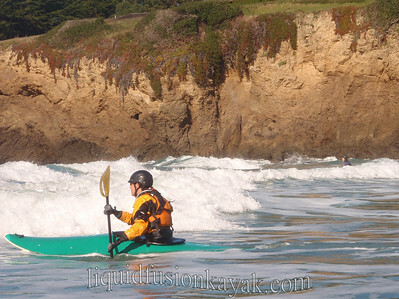 Kayak surfing has been on my mind as I decide if I am going to enter in one of the events at the Santa Cruz Kayak Surf Festival. 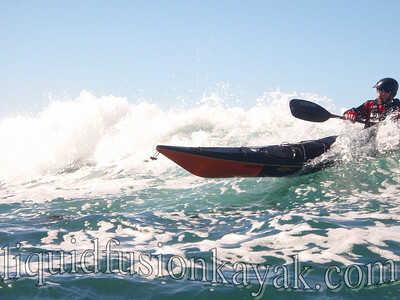 I just re-outfitted my mini-mako surf kayak and was looking for a mellow surf session to test out my new outfitting and get reacquainted with its slicy edges. 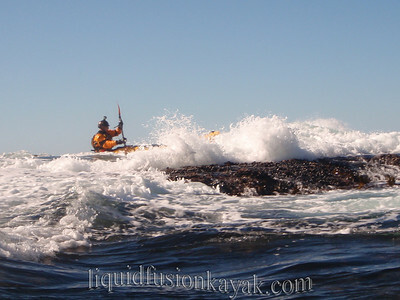 Tuesday, one of our river kayaking friends meandered over the to the coast and met up with us to look for surf. The swell was relatively small for this time of the year at 5-7 feet but with a 13+ second period meant that there was some power behind it. My favorite mellow surf beach was barely breaking so we moved on. With limited time, we headed to Hare Creek. 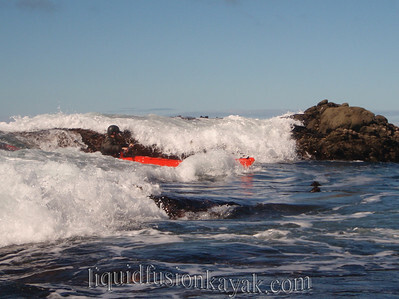 Hare Creek is a tricky spot to surf. 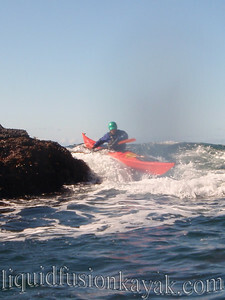 It is a beach break that changes quickly as the tide height lowers or drops. The outside can be a thumper and the inside can be confused with reflective waves. 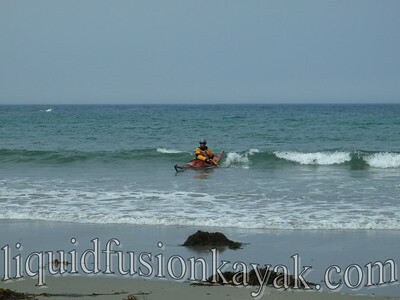 We have enjoyed some mellow sea kayak surf sessions there as well as some quality sinus clearing surf sessions. Jeff and Jerry headed out as I watched a couple of sets go through. I am still learning to read the surf and find that it helps to watch it from shore before heading out. Today there were definitely some thumping sets coming through but also some appealing left shoulders on the inside. I resigned myself to the inevitable sinus clearing of Hare Creek but wanted a couple of those spilling lefts. 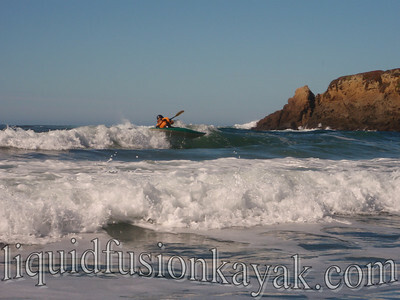 I settled into my surf kayak and paddled out. 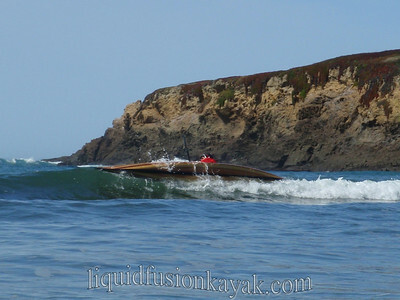 The slicey stern, planing hull, and rails on the boat contrast greatly with the bouncy, forgiving feel of my whitewater kayak. The crisp handling of the boat combined with the sunshine and cool splash of ocean water was exhilarating. I was ready to go surf some waves. Just as I was getting to where that peeling wave was, I saw the next set approaching. It was one of the larger ones. Where my spilling wave was became the impact zone. I paddled hard and tried to punch through the wave but it wanted to remind me that I wasn't in charge and tossed me like a rag doll. I tucked tight to the deck of my boat as it washed me about and surfed me toward shore. For a moment I thought, "Geeeezz . . . here we go again . . . another beat down session at Hare Creek." I erased the thought and rolled up and was faced with the freight train foam pile of the next wave of the set. I dug in and sprinted at it and over it. Alright, the big set had passed it was time to ride that left shoulder.